My research focusses on epigenetic changes that occur in cancer patients in response to drug treatment. Epigenetic processes are responsible for our cellular diversity, it’s what makes a skin cell functionally different to a liver cell for example, even though both of these cell types contain the same genetic code. Epigenetics does this by acting like a master regulator, switching genes on that are required by the cell to carry out its functions and switching genes off that are not needed. This gives us our repertoire of cells in the human body which have many different functions. The problem is that epigenetic processes are hijacked in cancer and this allows rapid growth and survival of cancer cells. Finding epigenetic and gene expression changes that occur in the bone marrow neighbourhood (microenvironment) and in abnormal blood cells in pre-Leukemic and Leukemia patients after drug treatment. This will allow us to better understand how current treatments work and why some patients respond to therapy while others do not, so we can try to prevent Leukemia from happening and design more effective treatments for these diseases. My interest in medical research started due to a passion for learning biology, particularly how the human body functions normally and during disease and combining this with my other passion of helping others. When my Nana who helped raise me, succumbed to colon cancer after a 5 year battle with the disease I decided to follow my interests and pursue a career in cancer research in order to focus on finding new, effective cancer treatments and markers that predict response to therapy. The main aim of my research is to learn more about how cancer cells and the neighbouring cells that support them (micro-environment) interact with each other, respond to treatment and change over time. Ultimately, my goal is to design more effective drugs that prevent cancer or prevent it coming back in patients after treatment (relapse), in order to combat cancer and increase survival of cancer patients. 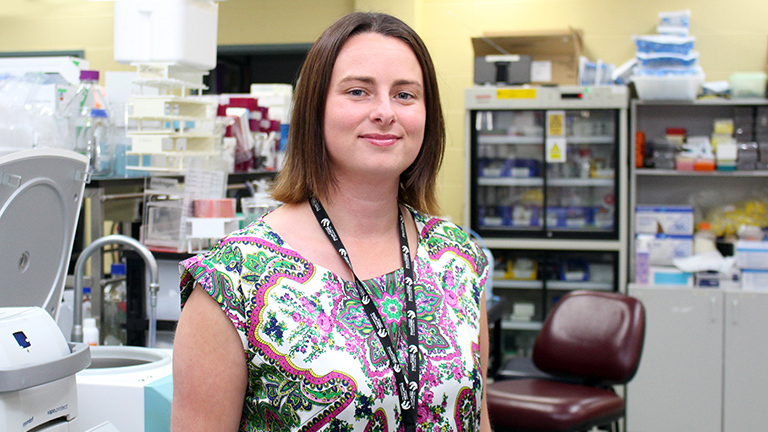 Dr Bond is an Early Career Researcher within the School of Biomedical Sciences and Pharmacy of The University of Newcastle. She is based at the Hunter Medical Research Institute (HMRI) and is associated with the Hunter Cancer Research Alliance (HCRA). She completed her PhD in Medical Biochemistry, which focused on post-transcriptional regulation of CD9 and CD151 by micro-RNAs in breast and prostate cancers at the University of Newcastle in 2015. From 2015 - 2017, Dr Bond tested novel, natural and synthetic compounds such as compounds from Vietnamese medicinal plants as anti-pancreatic cancer agents and was also involved in investigating blood markers for prostate cancer at the Ourimbah campus of The University of Newcastle. In 2018, Dr Bond joined the Cancer Epigenetics group led by Dr Heather Lee, as a post-doctoral scientist. She uses cutting-edge single cell sequencing technology to test epigenetic processes such as DNA methylation and gene expression in Leukemia patients following treatment with cancer therapies. She conducts research into finding novel markers that predict patient prognosis and response to current cancer treatments. Dr Bond has presented her research at both national and international conferences and continues to publish her findings in high impact journals. She has also helped organise local scientific meetings and has been an RHD representative for the school research committee and deputy convenor of the Australian Society for Medical Research (ASMR) Newcastle committee. She has received pilot grant funding through the Faculty of Health at the University of Newcastle and project funding from a CFMEU donor grant from HMRI. Dr Bond is currently striving towards building an independent research program that aims to investigate epigenetic and transcriptional heterogeneity in cancer cells and their surrounding micro-environment in response to cancer therapy. Dr Bond will continue to search for novel epigenetic and gene expression changes that occur in cancer cells and the surrounding micro-environment, in response to therapy in cancer patients, in order to better understand the actions of these drugs and to identify markers that predict treatment response. This will lead to novel drug targets and the design of anti-cancer therapies that will improve quality of life and outcomes for cancer patients.